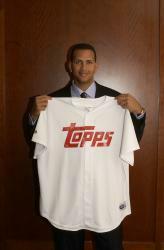 The Topps Company announced today that Alex Rodriguez has been named as the first-ever official spokesperson for its legendary baseball card line. "I remember collecting a lot of cards as a kid, more than I could afford," said Rodriguez. "Topps is the company that I've grown up with, so this is a special deal for me." The deal also grants New York City-based Topps exclusive rights within the MLB trading card category for autographed baseball cards, game-used memorabilia cards and Rodriguez's image use on packaging and advertising. "We found someone in Alex who embodies the values we have at Topps, which are hard work, dedication and integrity - and that's on and off the field," said Peter Sawkins, Group Marketing Director for Topps. Rodriguez, 29, already considered by many as one of the all-time greats, is enjoying success in his first year wearing the pinstripes. His 25 homeruns place second among American Leaguers while the Yankees boast the best record in the American League (63-37).